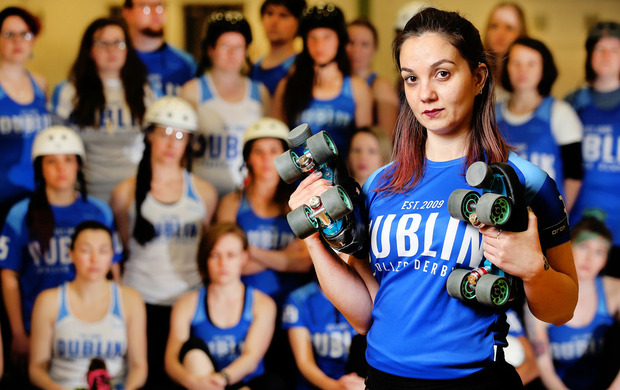 Sky-high insurance costs threaten to put the skids on the Dublin Roller Derby league. The roller skaters train in the Dublin City Council-owned community hall in Inchicore five times a week. To use the hall, they need public liability insurance. However, their new premium has jumped from €3,000 to €10,000 – threatening the future of the team. They have been told their sport is being re-classified and is now in the same category as sky-diving. There are currently 90 members of the Dublin Roller Derby league, some of whom featured in an Eir advert last year, and they each pay €45 a month. They also fundraise and have sponsors to help meet their running costs, including the cost of hiring the hall and insurance. Ms Devine said they would be unable to pay €10,000 for insurance and were being “priced out” of their beloved sport.